I'll try to do one of these per day. Orrville is one of 16 teams left standing in the entire state. Exciting times, no? 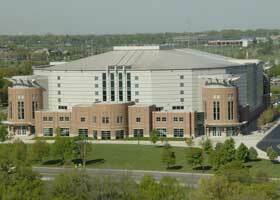 Pictured: Value City Arena (duh). Going to be weird going there instead of St. John Arena. 1. One of the best things about making the final four? The OHSAA does all the heavy lifting regarding our opponent and related information. See here. And of course, they call us the Red RAIDERS (on page 4...several times). It's now been fixed, thanks to someone who may or may not be me. Goodness sakes people, it's a dues paying member school, get the name right. Sheesh. I guess they should get partial credit for spelling Orrville correctly. 2. If we were to win 2 more games and be crowned state champs...that would give us 7 tourney wins for the season. Guess how many tourney wins we've had in the past 7 years? Yep. Seven. 3. Take a look here again (page 2, third column). Look at the Bishop Ready starting five. Four guys that are 6' tall or shorter? We clearly hold the advantage in size. But that also means this team is going to be very quick, with multiple ball handlers, and led by a guy that will probably be a 1st team All-Ohian in Joe Graessle (6'3" - 22ppg). 4. Orrville will be the home team on the scoreboard and will again wear their white jerseys. That's 5 of the 6 tourney games that we've been the home team. 5. Ticket sales start today. Click here for the schedule. Presale tickets are $8. 6. Don't think we've ever played Ready in basketball, but we did play for the state title in football in 1983. Not a good day for the Red & White. Read more here. 7. If you follow the blog through Facebook, I've already left a note about this, but Sunday March 21st was the best day ever on the blog in terms of site visits, pageviews and unique visitors. Had over 300 hits, over 1,000 pageviews and 228 unique visitors, all of those are all-time highs. Thank you, thank you, thank you. 8. Game will be broadcast on WQKT 104.5 FM (obviously)...but only on the radio. The state has an exclusive contract with OhioHSSports.com (I think) to handle all the webcasts. 9. Points update. Jake Bolyard now has 1130 career points, and 510 on the season. He's now the 6th player in Orrville history to score 500 or more in a season. The other 5 were Kevin Summers, Ralph Winters, Ron Wachtel, Chirs Royer and Tom Bolyard. Jake currently sits 6th on the all-time scoring list, right behind his father Tom (1277 pts. ), and with just 8 more points, will possess the 6th spot on the single season scoring list, again right behind his father Tom. Zach Wasson now has 1048 career points, and 457 on the season. A conservative estimate of 400 points for his senior season would put him 3rd on the all-time scoring list behind only Marcell Denson (1722) and Kevin Summers (1681). He will also likely become only the 3rd member of the 1000 points/600 rebound club. Marcell Denson and Anthony Durden are the other 2. I'm sure both would trade every single point they've ever scored for 2 more wins and a state title. 10. Ready Coach Don Worstell is making his first appearance in the final four, in his first season as Ready head coach. He previously was with Marion Elgin for 7 seasons, Franklin Heights for 2 season, and also at North Union. He brings his Silver Knights into Columbus with a 19-6 record and a career record of 136-125. His son is a teammate of former Orrville player and Smithville grad Tyler Bates at Marietta College. I truly appreciate your blog Tim and all that you have done to highlight the history of sports in Orrville and its great tradition. But, was it really necessary to include #2 on your list? Let's just move forward but somehow (as it gets stated on the athletic forums a lot of folks tend to visit) we keep "beating an old horse." By any chance, do you have any stats on how many programs have won a state title a year after they moved down a division? Good luck to the boys on Thursday and a BIG congrats to my friend Coach Slaughter for making the MOST of your rookie season! We are very proud of you!!! Thanks for the compliments. I dont have stats on teams who move down a division....Obviously we both know Orrville was the first team to repeat while moving up a division. I'm sure it's been done before.